The image above is a capture of the prototype Schwarzschild-Couder telescope on-site at Fred Lawrence Whipple Observatory. The image updates automatically every 20 minutes, or the page can be refreshed to load the most recent image (images taken at 10 second intervals). The Cherenkov Telescope Array (CTA) project is an initiative to build the next generation ground-based very high energy gamma-ray observatory, consisting of over 100 telescopes at two array sites. It will serve as an open observatory to a wide astrophysics community and will provide a deep insight into the non-thermal high-energy universe. The U.S. members of the CTA collaboration have pioneered the development of an innovative Schwarzschild-Couder telescope (SCT) based on the dual-mirror optical system first proposed by Karl Schwarzschild in 1905. It is designed to achieve a performance in CTA close to the theoretical limit of the technique. 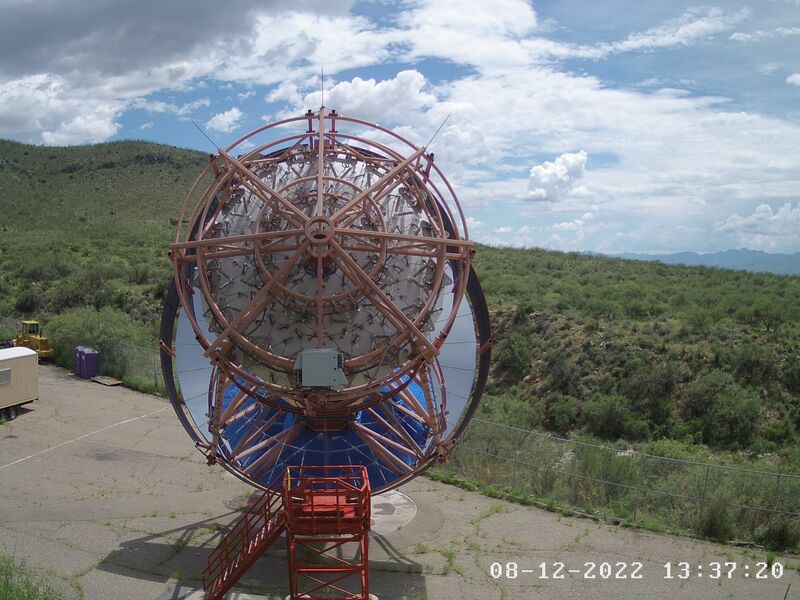 The prototype of the SCT (pSCT), now built at the Fred Lawrence Whipple Observatory adjacent to the VERITAS telescopes, will serve as a pathfinder medium-sized telescope (MST) for CTA. The MST array of SCTs in CTA is expected to significantly improve the angular resolution and dramatically improve the off-axis sensitivity of the observatory when compared to an MST array of conventional (VERITAS-like) Davies-Cotton Telescopes (DCTs). The first of its kind in the history of imaging atmospheric Cherenkov telescopes (IACTs), the pSCT uses a secondary mirror to correct comatic aberrations and achieve an aplanatic optical system with 8° wide field of view (FoV). The largest FoV of any IACT currently in operation is <5° (the FoV of VERITAS is 3.5° ). The demagnifying secondary mirror of the SCT improves imaging and significantly reduces the focal plane plate scale compared to the DCT. This permits the construction of a high imaging resolution, 0.8m diameter camera of the SCT with 11,328 pixels of 0.067°, while the equivalent DCT version of the MST is assembled from 1,570 pixels of 0.18° in a camera of 2.3m in diameter. The small plate scale of the SCT camera is compatible with novel silicon photo-multipliers (SiPMs), which are significantly less expensive than the traditional photomultiplier tubes used in the DCT (and VERITAS). It is thus possible to construct the SCT camera at roughly the same or even reduced cost. The advantages of the SCT for CTA are derived from the superior imaging resolution of its optical system in the wide 8° FoV. The fraction of all detected atmospheric cascades with the shower core inside or near the footprint of the MST array in CTA is significantly larger than for a four-telescope array such as VERITAS. The reconstruction of the arrival direction of the γ-rays which initiated these cascades is greatly improved when using SCTs, ultimately leading to better angular resolution. Compared to VERITAS, the on-axis angular resolution of the MST array of DCTs in CTA is greater by a factor of 1.4, while an SCT-based MST array offers an improvement of up to a factor of 2. This enhancement of γ-ray angular resolution increases further for off-axis observations of astrophysical sources. The differential off-axis point source sensitivity benefits dramatically from the improved angular resolution of an SCT-based MST array, which reduces the exposure time required for achieving a given sensitivity for a source at 3.5° off axis by more than factor of 2 (for an on-axis source the exposure reduction is up to 40%). This enhancement in CTA performance offered by the SCT has direct scientific implications on the detection of large angular-extent sources, sky surveys, as well as follow-up observations triggered by multi-messenger instruments (such as IceCube and LIGO-VIRGO) with relatively poor initial source localization. would like to contact a member of the team, please click the button to send us an email. website: http://www.cta-observatory.org/. The development of the prototype SCT has been made possible by funding provided through the NSF-MRI program.